Mammoet, a heavy lifting and transport specialist, said it has successfully loaded out the first batch of jackets for East Anglia One offshore wind farm project in the North Sea, England from UAE-based Lamprell Energy’s factories across the emirates. The company had in 2017 been contracted by Lamprell Energy for the heavy lifting and transport of 60 jacket foundations to the UK offshore wind farm project. ScottishPower Renewables’ new £2.5-billion ($3.08 billion) offshore wind farm, East Anglia One, will consist of 102 turbines in the North Sea, each rated at 7 megawatts, totaling an overall generating capacity of 714 megawatts. It is expected to generate power for more than 500,000 British homes every year, said the statement from the company. Lamprell was awarded the fabrication and supply of 60 jacket foundations and their accompanying piles. The jackets are placed on the seabed and form a secure platform for wind turbine generators to be fixed to, said the statement from Mammoet. 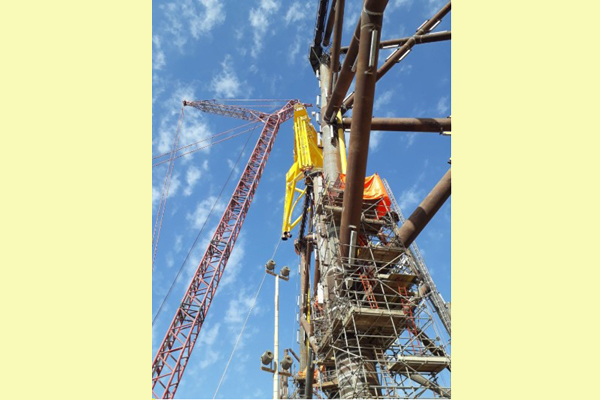 Under the contract, Mammoet has to perform heavy lifting and upending, weighing, transport and load-out of the jackets at Lamprell’s Jebel Ali, Hamriyah and Sharjah yards in the UAE, it stated. Once complete, the jackets will be loaded onto a specialist ship bound for Europe. Michel Bunnik, Mammoet’s regional sales director said: "We are proud to be the partner of choice for the heavy lift and transport services for Lamprell and excited to have the opportunity to contribute to a project of such a significance." Mammoet helps clients improve construction efficiency and optimize the uptime of plants and installations, stated Bunnik.